Harry's birth record, August 4 (? ), 1874, at the Portage County Courthouse in Ravenna, Ohio reports his name as Henry Seth Sharp. Harry is the English diminutive for Henry, which, apparently, he used throughout his life, and by which he named one of his two sons, and by which a grandson is named. In all legal references to his name in Texas, Harry has been the operative name used, including on legal documents. Harry is my paternal grandfather, known to me as Papa Sharpe. His Portage County birth record is a secondary source document. At some point in history, the courthouse had a fire in which many original records were destroyed, included Harry�s father, John Elsefer Sharp II. Later, county staff people assembled a birth record from other records in the county and nearby cities to represent best efforts at reconstructing a birth file. Papa Sharpe's gravestone in Georgetown, Texas cites a birthdate as August 26, 1874. That is the day "the family" always knew to celebrate for him. However, the reconstructed birth record, identified as FHL File Number 891394, his birthdate is August 4, 1874. My assumption is for the August 26 date as the accurate date, and the one we will use. Harry apparently was named after his uncle, Henry Sharp, his father's brother. Seemingly, of the four children in the family of John Elsefer and Elizabeth Sharp, only these two brothers moved to Ohio, John Elsefer Sharp II and Henry Sharp. The year that Harry was born, 1874, was the year that national leaders also were born: US President Herbert Hoover and English Prime Minister Sir Winston Churchill. Sir Winston is the eleventh cousin, once removed, to U.S. President Franklin Delano Roosevelt, my half eighth cousin. 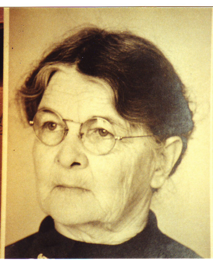 Our ancestor in common is our seventh great grandmother, Alice Carpenter Southworth Bradford. FDR descends from her first husband, Edward Southworth, and my line descends through her second husband, Plymouth Colony Governor William Bradford. Verdi's "Requiem" was composed in 1874 in Milan, Italy, as was Brahms' "Hungarian Dances" composed. And the first zoo in America was established in Philadelphia, Pennsylvania. Harry was born the same year as Thomas J. Watson, Sr., (2/17/1874 - 6/19/1956), the American industrialist who built IBM (International Business Machines, Inc.). It is of interest that on Mr. Watson's 122nd birthday, World chess champion Garry Kasparov beat the IBM super computer ''Deep Blue,'' winning a six-game match in Philadelphia. It took a long time to get the best of Mr. Watson's company! But, do not despair. Two years later, Deep Blue came back to beat Mr. Kasparov! Of course, I like this story, as IBM was my employer in1957-58 and in 1962-69. Harry was born the same year as was John D. Rockefeller Jr. (1/29/1874- 5/11/1960), the American philanthropist, who is the third great grandnephew of Johann Philip Rockefeller and Catherina Sharp, Harry's second great grand aunt and uncle. 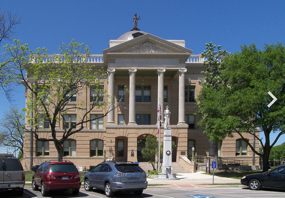 Harry came to Texas about 1895 at age 21, settling in Georgetown, Williamson County, a town that had been established in 1848 and is the county seat. We don�t know why he came to Georgetown, except to note that his older brother (by 26 years), Alfred Lansing Sharpe, had come to Georgetown about 1880, four years prior to the birth of Papa Sharpe. That, no doubt, was why he came Georgetown. 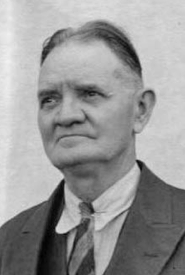 Of political interest is that Alfred Lansing Sharpe became a rancher outside of El Paso who was elected to the Texas State House of Representatives in 1906. He was the first ever Texas House Representative elected on the Republican Party ticket. Papa Papa Sharpe worked for the Railroad Express Company a long time. A part of his later occupational life was working in the Williamson County Tax Collector's office. 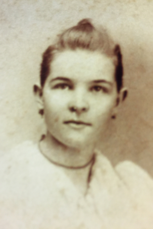 Five years after arriving, Harry married a local Williamson County girl from nearby Taylor, Mattie de Noailles Simons on January 7, 1901.They gave issue to two sons. 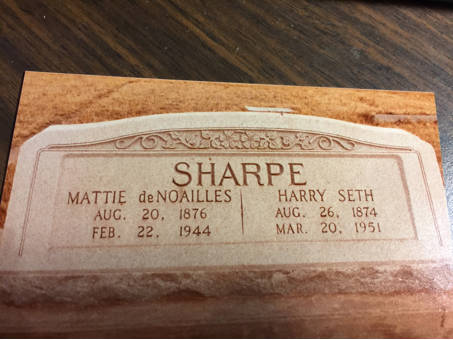 Dwight Alfred Sharpe was born September 4, 1901, and Harry Simons �Dee Dee� Sharpe was born December 19, 1904. He served in the U.S. military in the Spanish American War. It was the conflict that marked the emergence of the United States as a world power. This brief conflict between the United States and Spain took place between April and August 1898, over the issue of the liberation of Cuba. The war resulted in the United States winning possession of Guam, Puerto Rico, and the Philippine Islands. The treaty ending the Spanish-American War was declared in effect on April 11, 1899. Harry was a Private in Company L of the Texas Infantry. He drew a pension as of November 21, 1927, Certificate #A-8-6-28, Company L of the Texas Infantry. In historic narratives about the Spanish American War, it is noted that then Col. Theodore Roosevelt, the future President of the United States, had a recruiting effort in San Antonio to garner soldiers for the war effort. Roosevelt's recruiting was in the Menger Hotel, that gracious old place of hospitality, across the street from the famed Alamo. The recruiting story is available at the hotel today, where we have visited several times. When my parents lived in San Antonio in their senior years (1968-1981), the restaurant in the Menger Hotel was the favorite place of luxury that my mother relished to attend when dining out for a special occasion. Though we do not have information about Harry's recruitment, we believe it most likely took place at this San Antonio event, as it is reasonably close to Georgetown where Harry lived. On June 13 - 16, 2018, Suzanne and I lodged at the Menger Hotel while in San Antonio as Delegates from Wise County at the Republican Texas State Convention. Source: General Index to Compiled Services Records of Volunteer Soldiers Who Served During the War with Spain, #M871, Reel #100 and General Index to Pensions, 1861-1934, T-288, Roll #424, Pension#1597454. My son, Todd Wittman Sharpe, has a telescope I've handed down to him, which we believe was used by Harry in that Spanish American War. Harry is Todd's great grandfather. The telescope had been handed down to me from my father, who is the son of its original owner, Harry. It�s about 12 inches long in its collapsed state, but about 28 inches when opened for distant viewing. Harry was Lutheran, hearkening back to our original Sharp ancestor, Otto Scherp, and Mattie was from the Christian Church (Disciples of Christ). 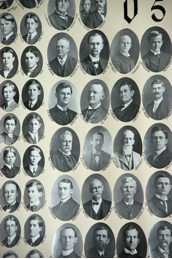 They combined their Christian practice by joining the First Presbyterian Church in Georgetown in 1903. They joined upon statement of their faith in Jesus Christ. Both of their sons were baptized there and later made teenage professions of faith in that church. Their two sons were my father, Dwight Alfred Sharpe, born September 4, 1901, and Harry Simons �Dee Dee� Sharpe, born December 19, 1904. 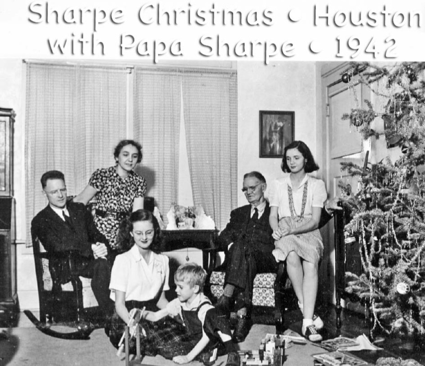 Though I don't know what his business associates called him (probably just "Harry"), he was always known in the context of the family and in my recollection as �Papa Sharpe.� In fact, I had such fond association with Papa Sharpe that it was chosen as the name by which I asked my grandchildren to address me. The Census in 1910 for Georgetown, Williamson County, Texas sites the occupation of Harry as a Deputy Sheriff. The Census of 1920 describes his occupation as Deputy Tax Collector, Williamson County Courthouse. The 1930 Census says his occupation was that of Accountant at the City Collector's Office. There was an out building behind their home at 1005 Main Street. It was called the Potato House. It was the place where Mattie (his wife) pursued her home industry of potato chip business during the 1930's. Those were the economic depression years of the U.S. economy and many people had to be creative to sustain their families. Long after needing to be used as a potato house, it became the retreat house for Papa Sharpe in his old age, particularly after he was a widower. Sort of his "office away" from the house, where he could be on his own. I remember making visits to that back house to the kindly old grandfather and hearing him tell his stories about the town and life in general. He would sit there amidst the swirl of the pipe tobacco smoke and spin his yarns. The most fascinating place around the large back yard of Papa Sharpe was the unusually long garage. It could be entered from the back yard of the house on Main Street, but it stretched out behind the neighboring corner house and opened onto the side street. That was a shortcut through which my cousins, Harry and Johnny, and I would go to get to the public park a block or so away for fun and play. The garage was filled with treasures of old pieces of various kinds of machinery, tools and miscellaneous parts. It was a marvel in which to explore. Papa Sharpe's younger son, Harry Simons (known as "Dee Dee"), and family lived with them in the old Sharpe home as one big community home. Ultimately, after Papa Sharpe died, the family relented to the urgings of the First Baptist Church next door on the north side to sell the home to the church for its expansion. Years later, that congregation relocated to the new suburbs, but a remnant of it remained, and the church name was changed to the Main Street Baptist Church, as it still is in 2018. It is of interest to note that John D. Rockefeller, Sr., the world-known petroleum industrialist, donated the church bell to that First Baptist Church. The Sharpe's, I am confident, did not realize it while they were neighbors, but Rockefeller was the second great grandnephew, twice removed of Harry's great Uncle Johann Philip Rockefeller, husband of Carthrina Sharp. The donation of the church bell also is told in the "Williamson County, Texas, Its History & Its People," by Mrs. Jean Shroyer and Mrs. Hazel Hood, Williamson Genealogical Society, Inc., Round Rock, Texas, 1985, page21.) We do not know the circumstances which brought Rockefeller to know about the need and to donate a bell to the First Baptist Church of Georgetown. My visit in 2005 to the Main Street Baptist Church offices resulted in my being told that a long-time member�s recollection simply was that another member took it upon his or herself to write a letter of request to Mr. Rockefeller for the bell. Must have been a well worded letter! Dee Dee served in World War II in the U. S. Navy. 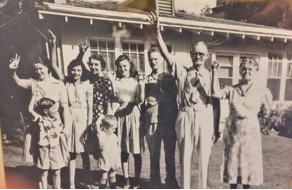 One of my favorite family photographs is one taken by Dee Dee of all the family member bidding farewell to him as he left home to join the war effort. I am the youngest one in the photo. This is about 1942. The church's initial use of the old Sharpe home was for its children's ministries. Later, new buildings replaced the old Sharpe home. Harry died in 1951, the year the 22nd amendment to the U. S. Constitution was passed, limiting the service in the office of President to two terms. It was the year J. D. Salinger published "The Catcher in the Rye," and the "Caine Mutiny" by Herman Wouk earned a Pulitzer Prize. Source: "The Timetables of History" 3rd Revised Edition, Bernard. Grun, Simon & Schuster, New York 1991, page 532. Papa Sharpe is buried at the Odd Fellows Cemetery close by the rear of Southwestern University, alongside of his wife, Mattie de Noailes Simons Sharpe. Subsequently, both of his sons and their wives were buried in the same plot. His brother's wife, Mrs. Alfred L. (Lucy) Sharpe and their son, Alfred Lansing Sharpe, Jr., are buried in that plot. His grandson, Johnny, is also buried in that cemetery, but not in the original Sharpe plot, as it was full to capacity when Johnny passed away. 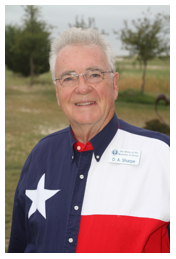 Papa Sharpe was an interesting, yet very dear man with whom my fairly few occasions to visit were cherished in my memories. My wish would have been to sit at his feet to hear more stories for longer times. He graduated to Heaven in Georgetown, Texas on March 20, 1951, just two days after my first public confession of faith in Jesus Christ as Lord and Savior had been made at the Trinity Presbyterian Church in Houston, Texas. There is a 92-page genealogical report of Papa Sharpe�s descendants covering five generations created by the marvelous presence of my grandparents. Praise be to God!